RJ Power Rail is pleased to announce the successful completion of its contract for the replacement of HV and pilot cables at Feeder 1607 Northfleet Grid to Northfleet Substation and 1608B Stone Crossing Substation to Ebbsfleet Substation. A full project case study has also been added to our website, which includes some excellent client feedback – you can click here to read the full extent of the project. 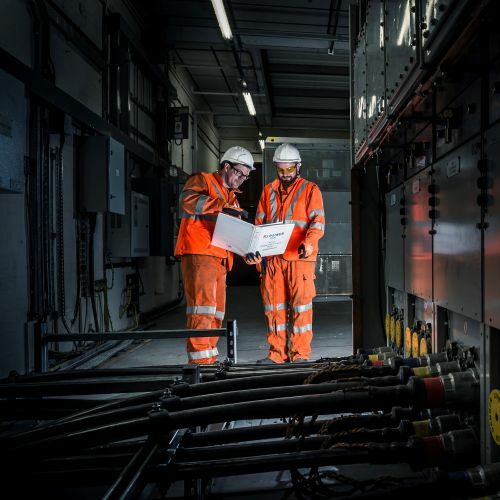 The works form part of a five-year framework on behalf of Network Rail Infrastructure Projects (NR), to deliver electrification and plant upgrades and renewals in the southern region. Having been approached by long term strategic partner BCM Construction to specifically deliver the full electrical scope, RJ Power Rail’s team worked collaboratively to install, test and commission the project back into service. The full scope of works covered the refurbishment and replacement of high voltage feeder cables between the substations, replacing existing 185mm Aluminium cabling with new 300mm Copper 33kV cabling, renewing pilot cables and installing optical fibre telecommunication cables. RJ Power Rail has again supported the successful delivery of another investment programme; enhancing the railway infrastructure in order to cope with future requirements of increased train frequency and higher capacity services.